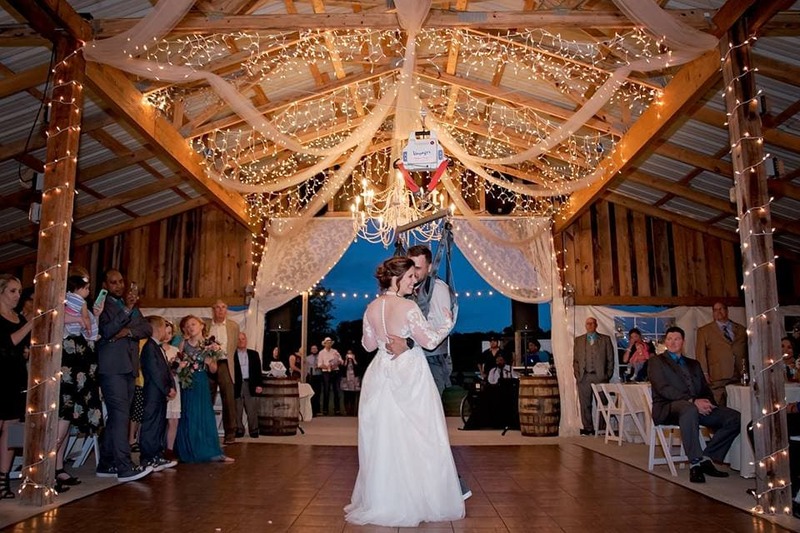 Kiersten Downs was ready to enter the rustic barn venue to marry the love of her life. 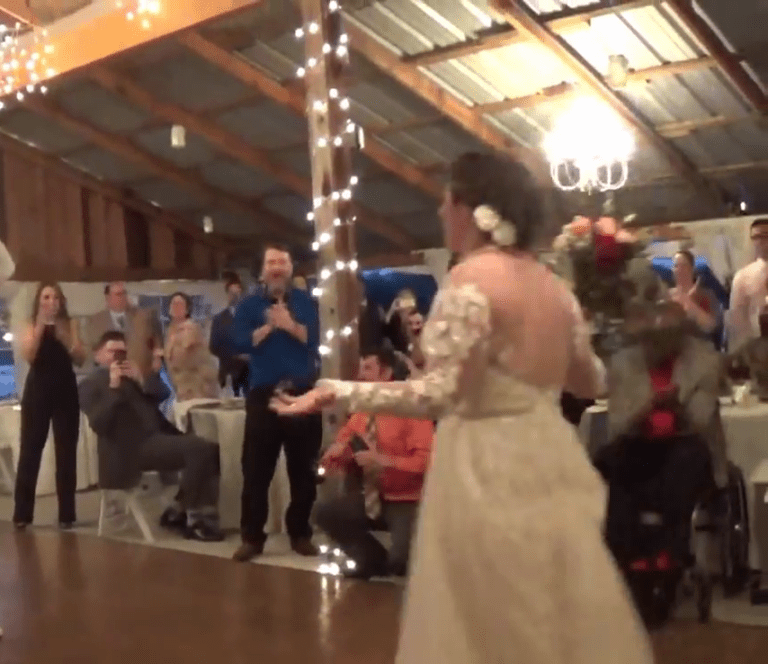 With a wedding reception like no other, the young lady couldn’t wait to see her dazzling groom. However, nobody could find him. As a bride, you want everything to go exactly according to plan. So if any crazy surprises happen or something doesn’t go your way, it’s understandable to feel a little stressed out. 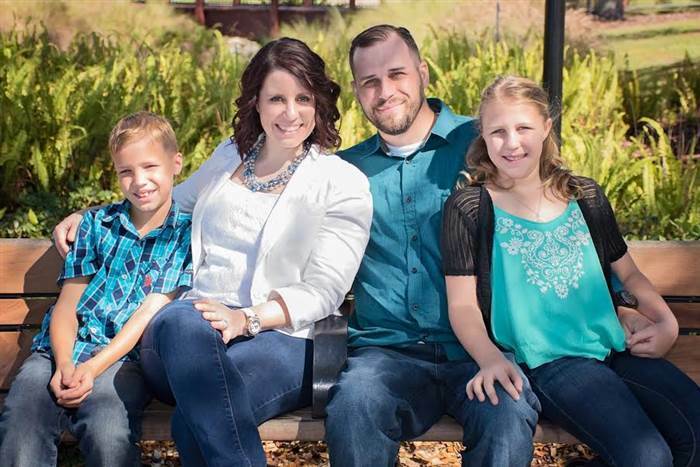 35-year-old Kiersten Downs should have been more used to unexpected occurrences, especially after serving in the Air Force. 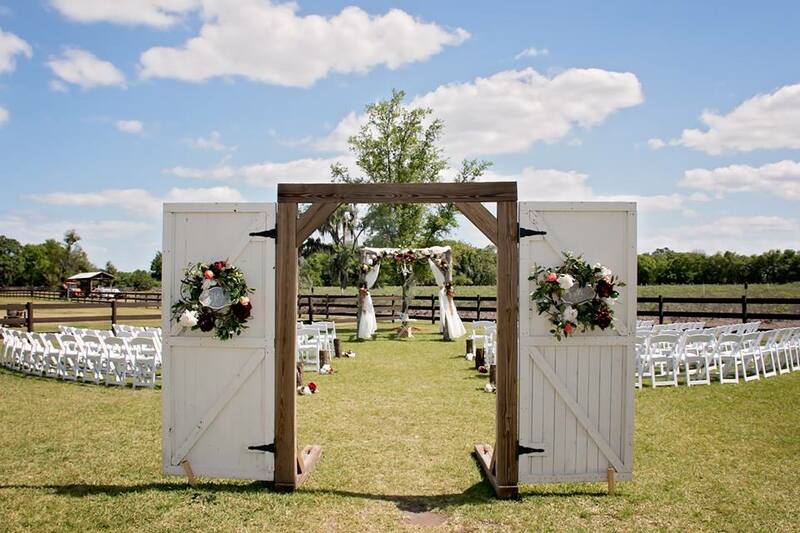 The Tampa, Florida resident and her groom to be, 33-year-old Thomas Martineau, both did the noble honor. 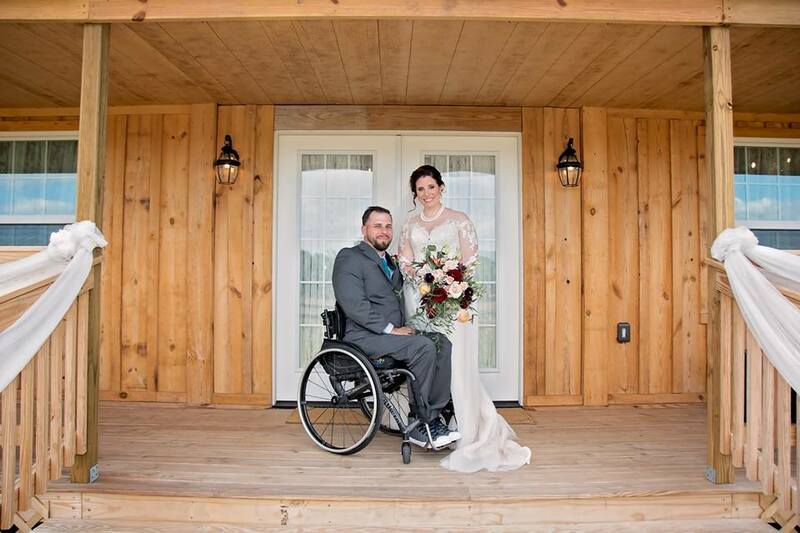 Despite the physical challenges that Thomas has faced, the couple has adapted over the years and, having met him after his accident, Kiersten didn’t know him any other way. 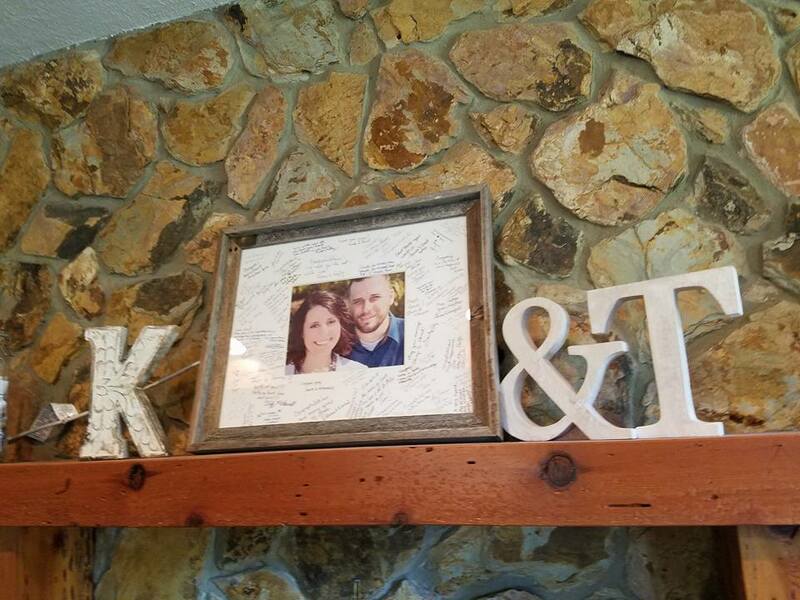 Certainly not your typical couple, Kiersten and Thomas’s shared involvement in the Air Force was certainly a great way for them to break the ice. Interestingly, the couple actually met on Facebook. 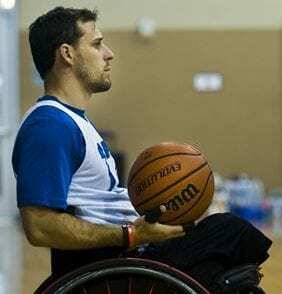 Kiersten had been looking for a player for The Tampa Bay Strong Dogs, a basketball team comprising of disabled veterans. 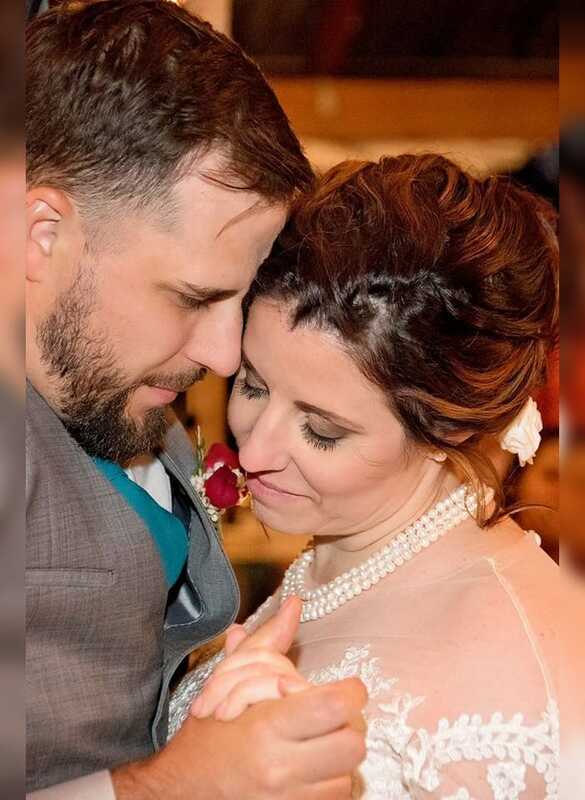 Although a number of logistical problems have been thrown at them over the years, especially where their wedding plans are concerned, Kiersten and Thomas have never lost hope that one day they would tie the knot. It was just a matter of days prior to their big day that Kiersten and Thomas received a huge setback in their wedding plans. 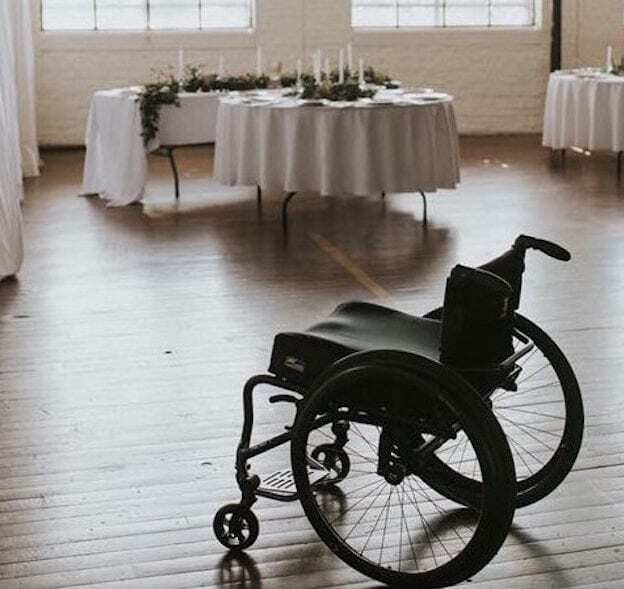 It turns out that the groom’s paralysis was causing some unforeseen problems and, as a result, he needed to be taken to an emergency room immediately. There is no doubt that this was a challenge the couple had not seen coming. After spending so much time fighting for some quality medical care from the hospital, they now faced this huge problem. 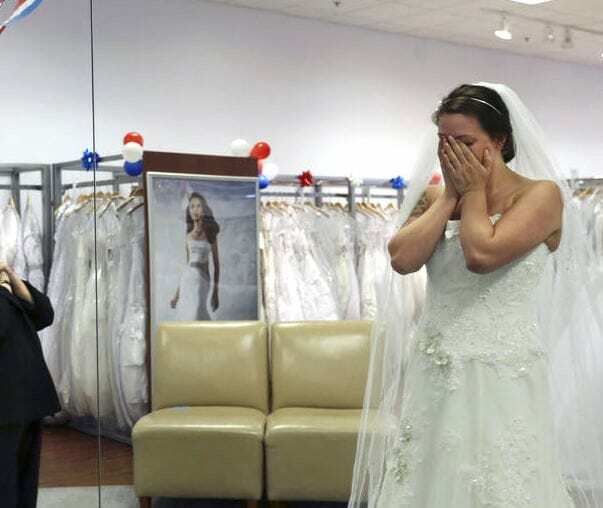 Despite facing such a tough ordeal just days before their wedding, Thomas would get some much needed good luck at this critical time. However, with his health being the top priority, the couple chose to reschedule the event to March 2017. 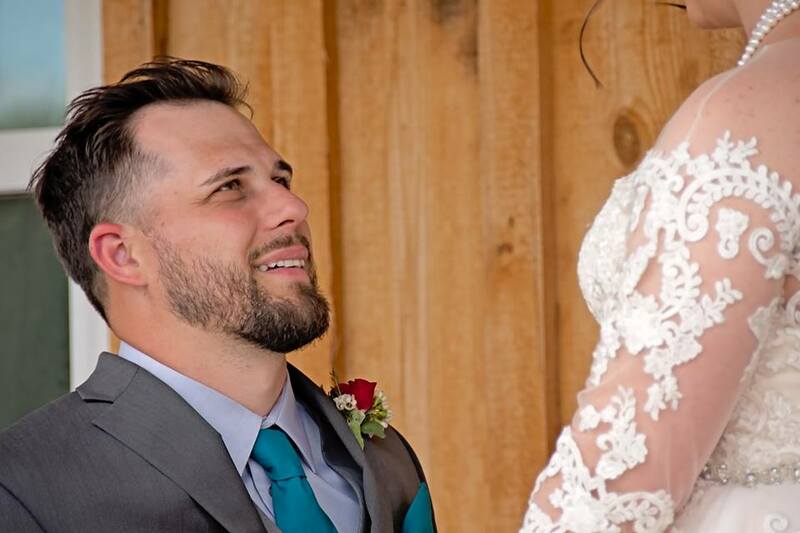 While both the bride and groom were rescheduling the event together, Thomas took some matters into his own hands as he was keeping a secret from Kiersten. 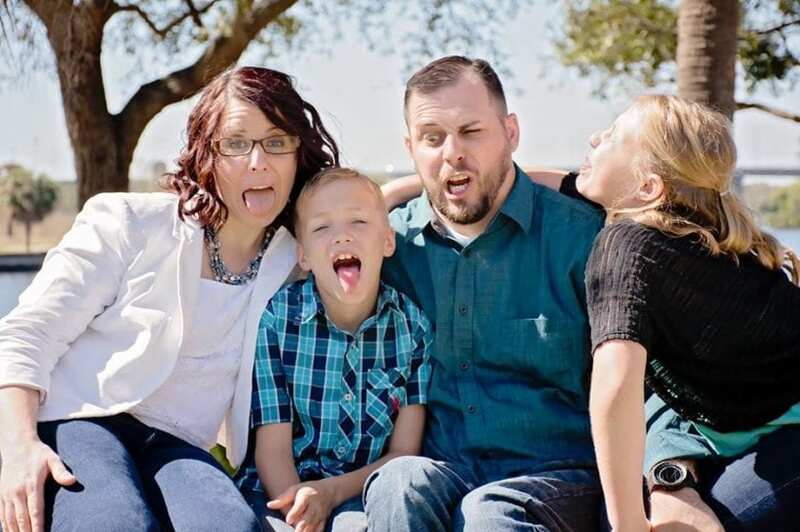 Thomas’s remarkable story began back in 2004 when he joined the Air Force. 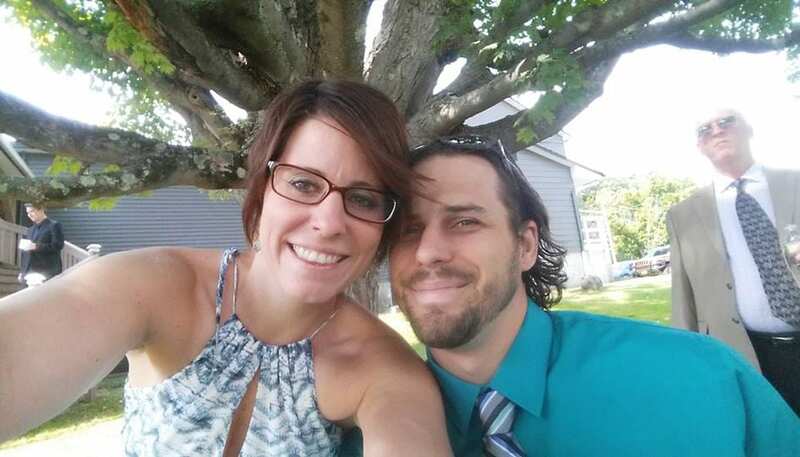 For four years, the man who would eventually be Kiersten’s groom worked as a Tactical Aircraft Maintenance Technician. Eventually, he would earn the rank of staff sergeant and was a well-respected member of his team. 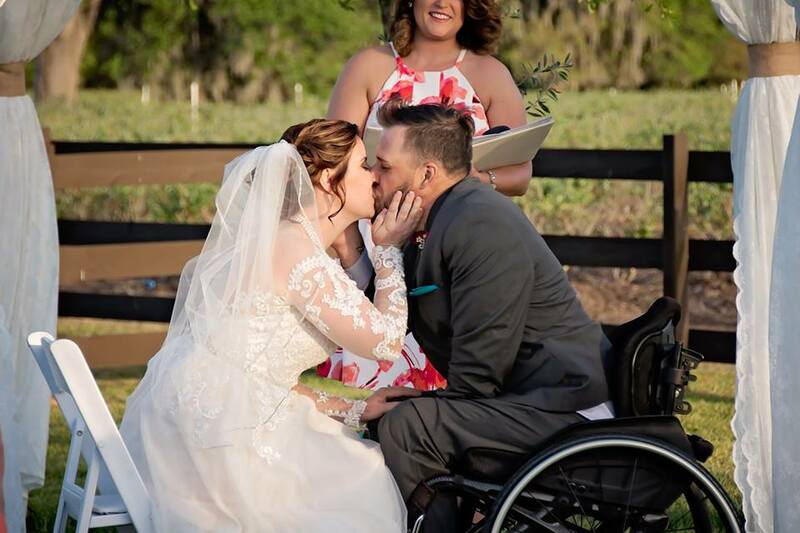 As for the groom’s bride-to-be, Kiersten Downs, she also had many reasons to feel proud of her service. Having also followed in the footsteps of her grandfather, who served in World War II, 18-year-old Thomas was inspired to continue the family’s legacy. Amazingly, the first two of her three tours saw Kiersten travel to some of the smaller islands in the Pacific. It was here where she would load bombs. However, her deepest memory came during her tour in Iraq. Upon arriving at her Iraqi airbase in 2006, Kiersten didn’t quite realize how painful and emotionally devastating war could truly be. And the moment that she started to see bombs hit Iraqi buildings, something struck a chord with her. Walking through local hospitals and seeing the victims of the war also upset her a lot. Upon returning to the United States, Kiersten was a broken person and needed something, or someone, to come into her life to help her truly heal. 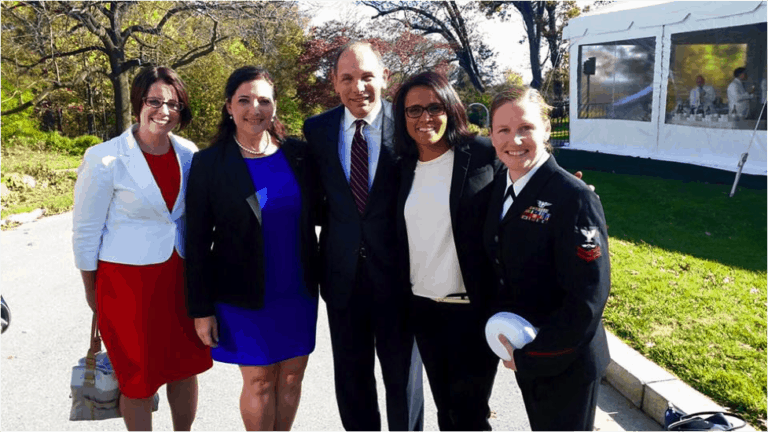 After returning home and being awarded a scholarship in honor of her service, Kiersten was still finding a way to make sense of everything that just happened in Iraq. 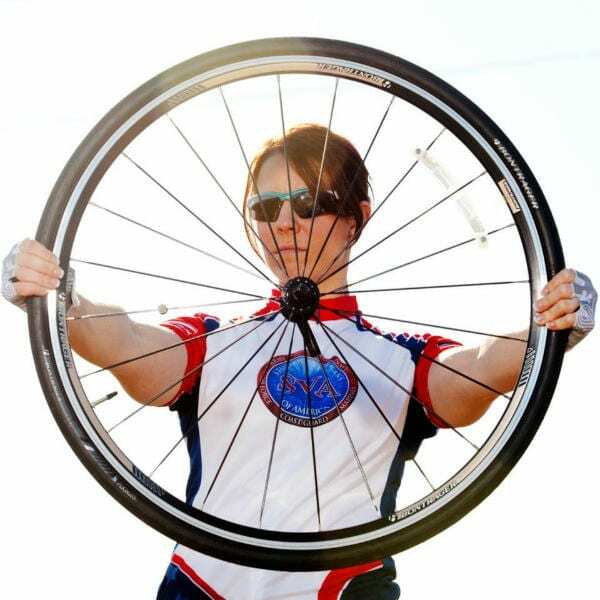 Of course, a lot of planning and training would need to be done in order to embark on a successful cross-country bike ride. However, upon starting her journey in California, Kiersten was in for a big shock to the system. The moment happened when Kiersten was in the middle of a high-velocity ride up a mountain, exerting all of her power with every pedal. 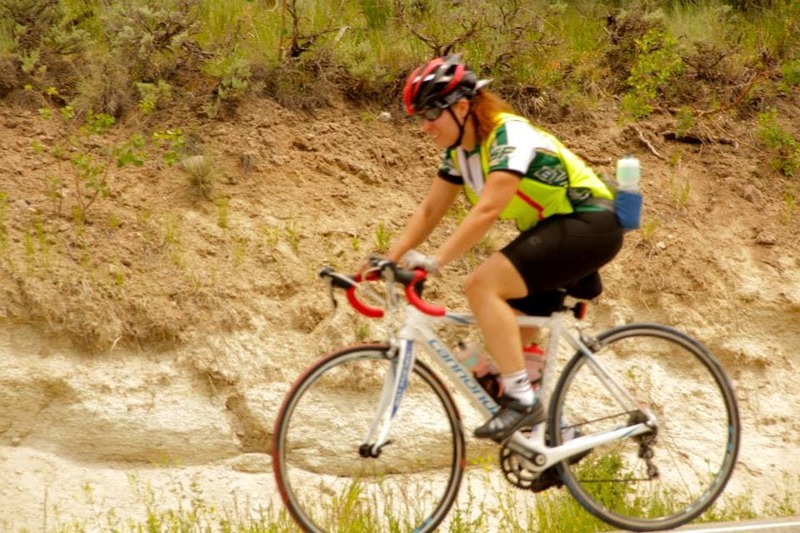 With a huge truck arriving around the corner, Kiersten jumped back on her bike and with as much adrenaline as possible, tried her very best get out of the way. Despite getting some much-needed support from her mother, Kiersten was dealt such a huge blow in her ride after just a week. 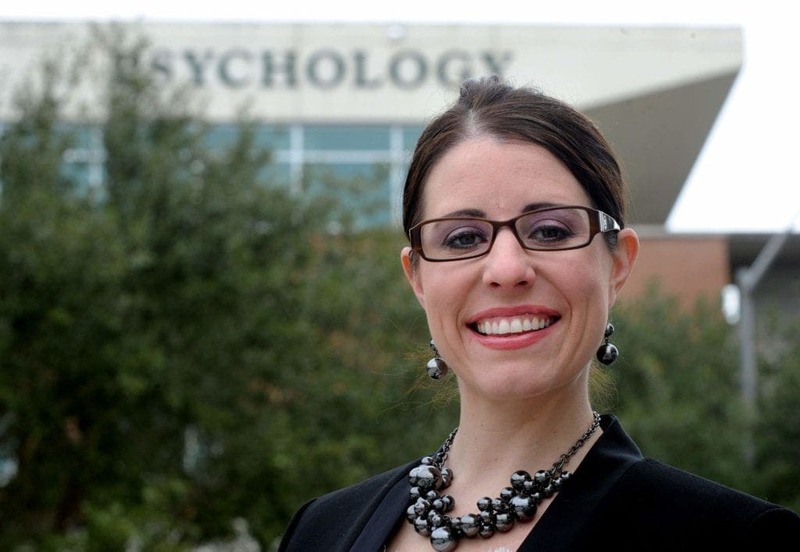 In order to focus on her health, she took a step back from the journey. 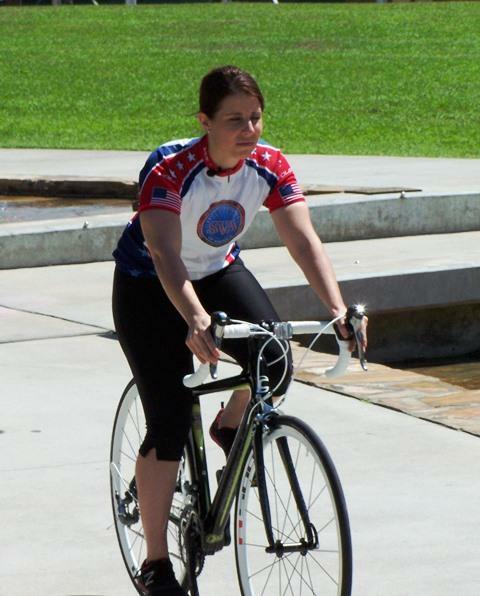 Although her ride was postponed, she had raised money for the Student Veterans of America. 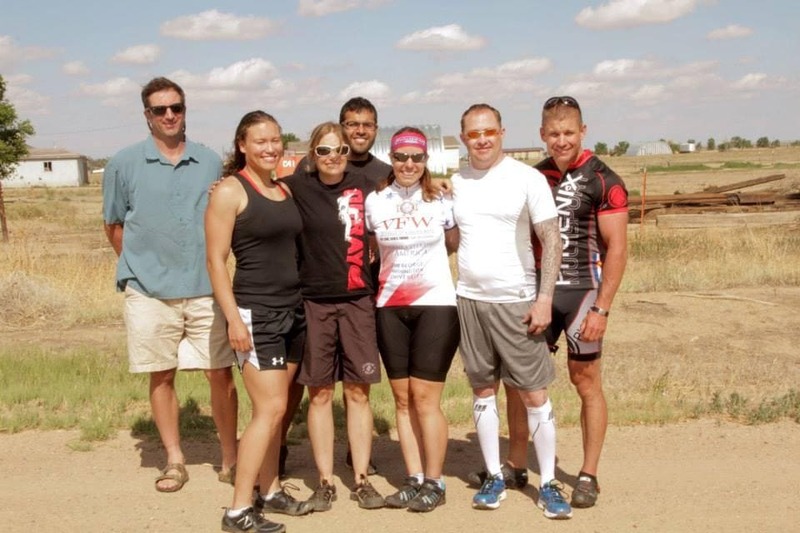 Seeing that the charity had such a huge network of people involved, Kiersten received a ton of support and many students ended up doing the cross-country ride in solidarity. 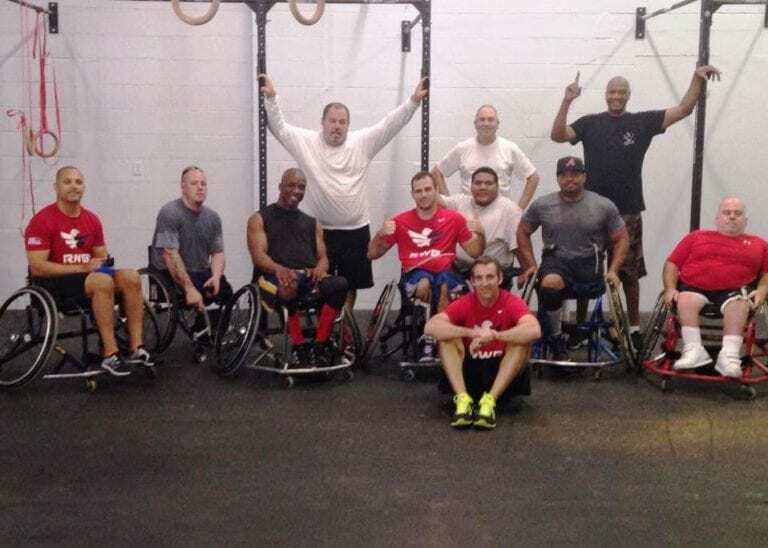 Moving onto her next project, Kiersten started recruiting for a disabled veteran basketball team. 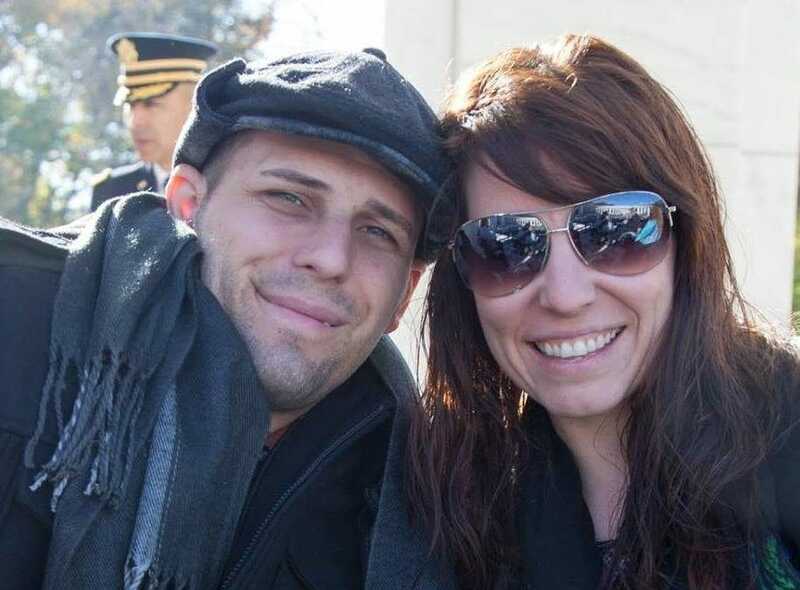 It wouldn’t take long before Kiersten and Thomas started talking online and, while they struck a bond, it would take some time before they met in person. While Kiersten and Thomas pretty much hit it off instantly, there were a few fascinating details that they would learn about each other. If it was somebody else, these details could have very much been a deal breaker. Kiersten soon learned that Thomas had a couple of kids from a previous relationship. Also, Kiersten had previously been reluctant to marry anyone. However, the two were able to confront their pasts head on and embrace everything about each other. 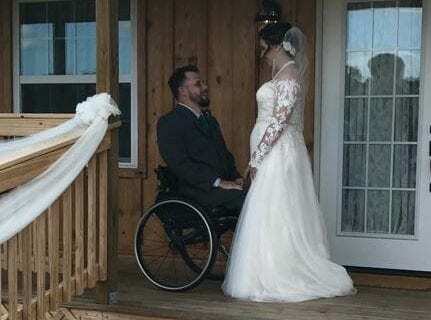 After so many hiccups and speedbumps along the way, the bride and groom had rescheduled their wedding date for the third time. They were extremely hopeful that this would be the last time they would have to make any huge changes. However, there will still some details about the wedding that hadn’t been hashed out, such as the nature of their first dance. “I thought I was going to sit on his lap and roll around and grab the kids to dance and sort of improvise,” she said. After years of service and meeting so many unique people from different backgrounds, it made sense that Thomas would have a couple of connections here and there. Stephen Hill was the guy who the groom trained under in order to get into great shape for the wedding. Thomas knew that he needed to be in top condition for such a demanding day. In order to make it a surprise, he didn’t tell Kiersten about his training routine. It may have been a winter day in Tampa, but there was no denying that everyone was extremely excited about the wedding. Kiersten woke up at the crack of dawn and she simply couldn’t contain all of the emotions that she was going through. While Kiersten was busy getting herself ready for the occasion, Thomas the groom was sitting back as he questioned whether or not his seemingly foolproof plan would actually work. Amazingly, there were only three people attending the wedding that knew about his plan. 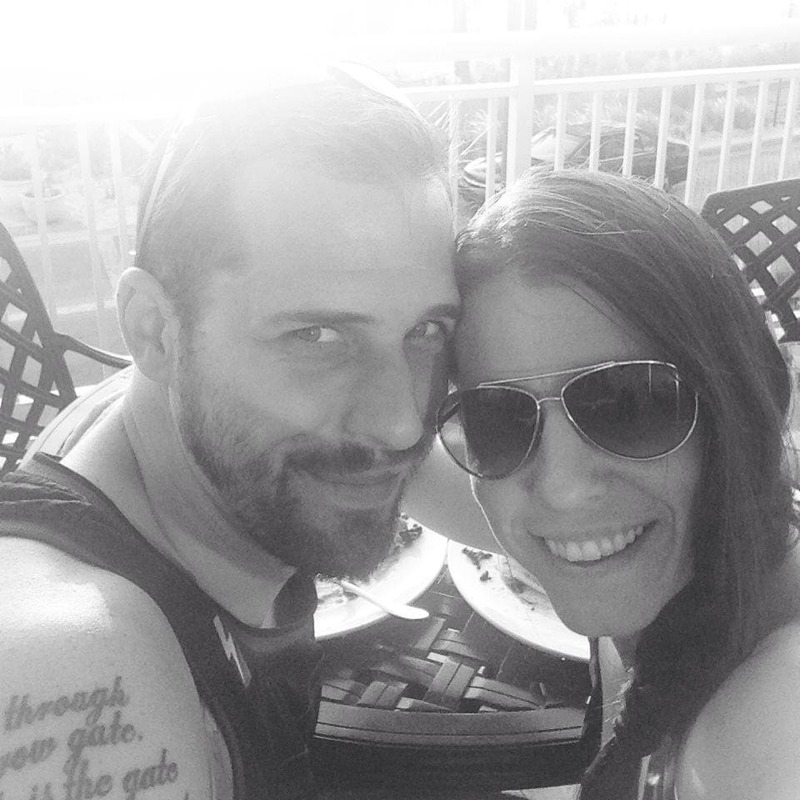 These were him, the wedding planner Michelle, and his friend, Stephen Hill. Despite being completely prepared, Thomas was worried that something would go wrong. Nevertheless, the event was approaching and Thomas needed to trust himself. When it came to the actual ceremony, both the bride and the groom were thrilled to look back on it knowing that nothing went wrong. Everything went according to plan when they recited their vows. With the build-up to the wedding party in full effect, Stephen Hill pulled Thomas to one side to discuss their secret plan. “Steve came in the day of the wedding, and he was sure it was going to work,” he said. 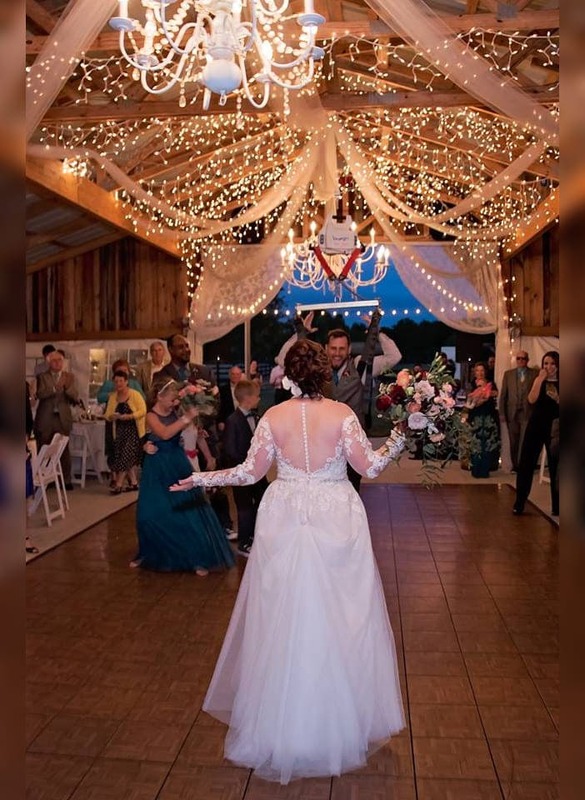 When she was standing outside the barn venue worried about her seemingly missing husband, Kiersten was completely taken by surprise when the song “Unbreaking Your Heart,” which was planned for their first dance, started playing. At that very moment, Michelle dragged her inside, where Thomas was waiting for her. Kiersten was absolutely lost for words. “I danced my way in and had to adjust my eyes because something was different,” she told Today. Amazingly, Thomas was not in his wheelchair. He was standing straight in the middle of the dance floor. Overwhelmed with joy and confusion, Kiersten went over to Thomas and held him. In the most natural of ways, they started to dance in sync to their beautiful song. But how exactly did the groom overcome such a challenge? It was a mystery that was perplexing everyone in attendance. 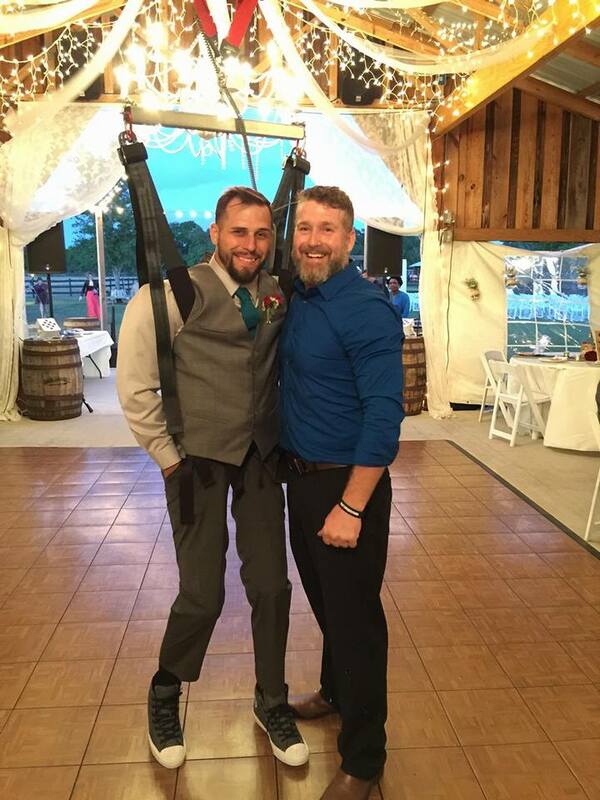 The explanation behind the groom’s incredible recovery was pretty simple: Stephen Hill and Thomas had applied a system of wires to the ceiling of the barn, which supported the harness that was holding the veteran upright. It wasn’t just Kiersten who was overwhelmed with joy to dance with her husband. Thomas’s kids were also delighted to see their father standing. They also got a chance to dance with their dad. It was perfectly natural for Kiersten to be worrying about whether the harness was secure enough or not. Thomas and Stephen also raised their concerns while planning the audacious move. However, the entire trick worked and the newlyweds were able to dance the night away. “When you surround yourself with a good community, anything can happen. We met people who put us in touch with Steve, through those open mics — they all had an incredible impact on us,” Thomas said. 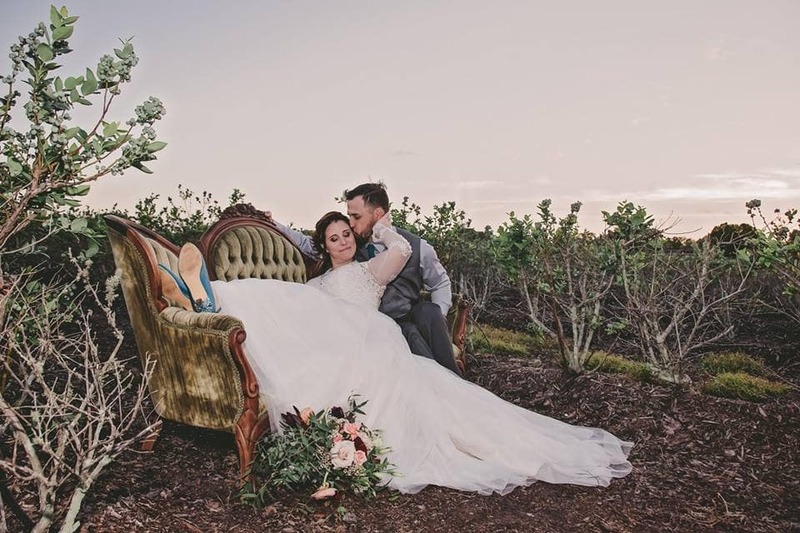 Although it has been a long, exhausting journey leading up to Kiersten and Thomas’s incredible wedding, in their mind, it was all completely worth it. Now, they are very optimistic about the future and are ready for anything.